The answer in 140 characters: Work 35+ years, earn the maximum, wait as long as possible to retire, minimize income in retirement, avoid state taxes, stay alive. Oct. 2, 2018, 7:43 p.m.
Oct. 2, 2018, 7:17 p.m.
For Americans, Social Security should be a part of the retirement plan. Unfortunately, Social Security typically won’t be enough to cover all expenses in retirement or provide enough money for the lifestyle one would like. Social Security is a government program that monetarily assists Americans after retirement or if they become disabled. So how do you get the most out of the system? Here are a few ways to maximize your benefits. TL;DR answer in 140 characters: Work 35+ years, earn the maximum, wait as long as possible to retire, minimize income in retirement, avoid state taxes, stay alive. Social Security calculates your benefits based on the average of your top 35 earning years. This may seem like a long time, but even if you retire at 66 you wouldn’t have needed to start your career until 31. If you started earlier, this gives you time to get a higher paying job. You may even want to take a few years off to raise children. As long as you’ve worked 35 years, your non-earning income years won’t count against you. The current Social Security maximum taxable earnings for 2018 is $128,400. The maximum taxable earnings for 2000 was $76,200 and $51,300 in 1990. This number grows with inflation. So, if you want to earn the maximum benefit, earn just as much as the maximum amount. But if you earn over the maximum, that amount is not taxed by Social Security so the effective tax rate (as a percentage) starts to drop for very high earners. Some dream about the days when they can retire and fire their boss. They count down the days until that reach that ultimate retirement age. Even if you have an itch to retire as soon as possible, you may want to wait it out. If you retire at age 62 your Social Security benefits are discounted by 25%. You’re losing your full benefits by retiring early. On the contrary, if you wait, you could receive up to an additional 7% each year up to age 70. Understandably, sometimes life happens and you may have no choice but to retire. But if you can resist, wait as long as possible. You may intend to work well into retirement. Maybe you enjoy what you do or have a hobby that earns extra income. But don’t earn too much because it could cut into your benefits. After a certain amount of income, Social Security earnings are treated as taxable income and are taxed at whatever bracket you fall into. If you file your taxes individually and earn between $25,000 and $34,000 a year, you may be subject to paying taxes on 50% to 85% of your Social Security benefit. For those filing jointly the threshold is $32,000 - $44,000. This may be more of an incentive to wait to pull your benefits until you are 100% certain you’re ready to retire. You’ve worked hard for your benefits, you don’t want the government taking most of it. There are many strategies for minimizing taxable income in retirement such as using Roth IRAs, and timing withdrawals from 401k accounts (such as before claiming Social Security). The Wealth Meta Income Spending Simulator may be useful in helping you work out the optimal timing of your retirement and other withdrawals. Where you live in retirement can have a significant impact on your benefits. Did you know that many states tax your Social Security benefits? If you want to steer clear of taxes on your benefits, you may want to consider moving to states like Florida, Arizona, or the Carolinas. Social Security is taxed in Colorado, Connecticut, Kansas, Minnesota, Missouri, Montana, Nebraska, New Mexico, North Dakota, Rhode Island, Utah, Vermont and West Virginia. Do consult your CPA or tax professional regarding taxes and Social Security as it is very complicated. So, if you’ve ever dreamed of having summer all year round, you may want to pack up your stuff and move to a warmer destination. What good are your benefits if you pass away before you can receive them? The longer you live the more you get out of Social Security! One of the most important ways to maximize your benefits is to stay healthy. Take a trip to the gym, walk around the block, eat well, visit the doctor and rest often. Your benefits serve no purpose to you after you pass away. Lastly, create a personal my Social Security account. By creating an account you can monitor your benefits and keep track of your standings. You can see how much you’ve earned and what your benefits would look like. It will also help you prevent identity theft. 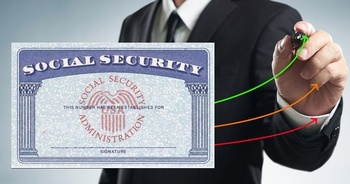 One of the most popular ID scams, prey on elderly Americans Social Security benefits. If you create an account you can make sure your benefits remain safe. At Wealth Meta we are all about helping you meet your financial goals. Given how little Social Security pays out and the fact it is becoming insolvent, you shouldn’t rely on it for your entire retirement. Social Security is still a key factor when analyzing retirement income and spending. Putting Social Security into FIRE equivalent terms, if your Social Security benefit is $1,500 per month, or $18,000 per year, and assuming a 4% safe withdrawal rate that income is equivalent to having $450,000 in investments. That is $450,000 less that you need to have saved before retirement to meet your comprehensive goal.